HERE’S MY NEW SEA TURTLE. HE IS A HAWKSBILL SEA TURTLE. I DREW HIM YESTERDAY. THIS IS A DRAWING I PLAN TO USE IN MY NEXT PAINTING. 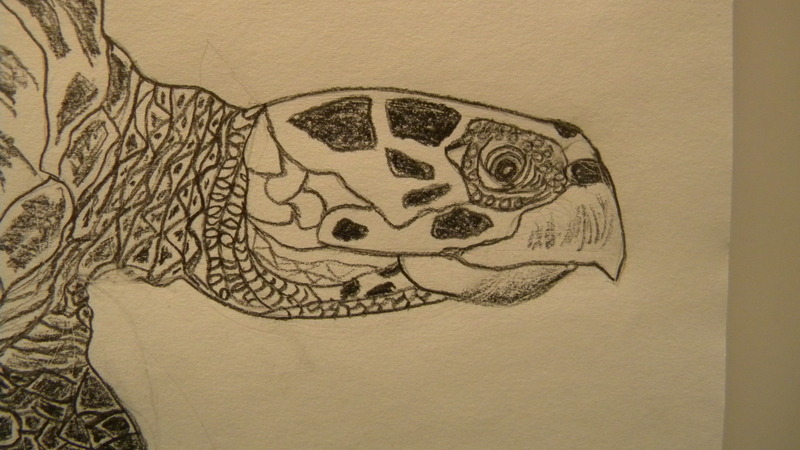 THIS WILL BE MY THIRD SEA TURTLE IN A SERIES OF HOPEFULLY, SEVEN. THAT’S MY PLAN, ANYWAY! ALSO, I AM PLANNING TO MAKE A POST SOON ABOUT A GREAT BOOK I READ THAT HAS INSPIRED ME IN MY ART AND PURSUIT OF AN ART CAREER. 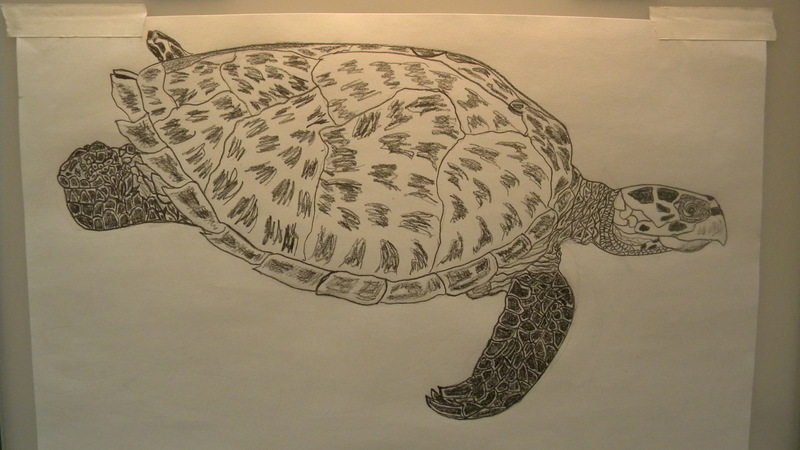 Posted on April 16, 2014, in Sea turtles and tagged drawings, pencil drawings. Bookmark the permalink. 6 Comments. Thank you so much, Elena! I just love them. I’ve been reading all about sea turtles and drawing them for the last few months. 🙂 How was your vacation? A REALLY good turtle drawing! Great job, Patsy! Nice detail around the eyes. I’ll look forward to your book review. I hope you’ll write a final post with all 7 sea turtles together. I love turtles! Thank you, Jill! It was a fun one to do. I asked people on my Facebook art page for suggestions of a name for him. Doing a final post with all of them will be fun. Thanks for suggesting it! 🙂 Aren’t turtles awesome? I’ve liked them since I was a kid, but I never actually went out looking for any when I was growing up. Weird, huh? I’ll have to find you on FB…I’m not on very often. For whatever reason, when I think of turtles I think of the name Sheldon for a male and Shelly for a female. Yes, turtles are awesome. We have a lake in our back yard and I love to watch the baby turtles after they hatch. They like to hang on the stray branches that rest in the shallow areas of the lake. I need to get some pictures. Jill, you’re so blessed to be able to see turtle hatchlings! I would love to see pictures of those. 🙂 Sheldon and Shelly are definitely possibilities for a name! Thank you!